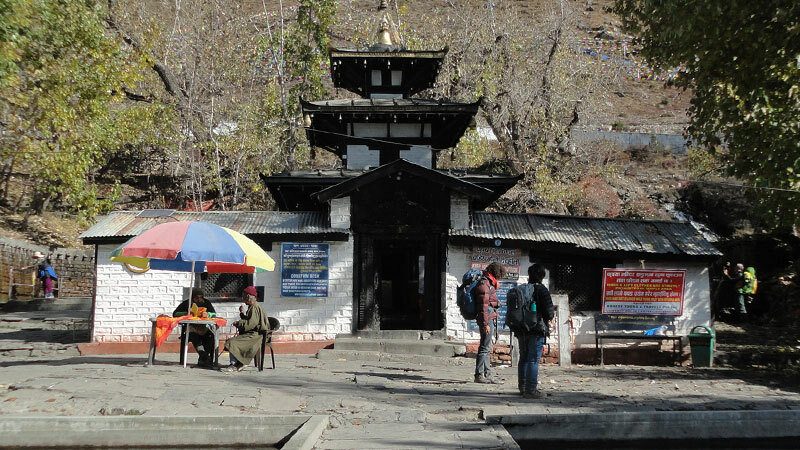 Muktinath Temple Tour is a famous spiritual yatra for both Hindus and Buddhist. Yearly, many devotees from inside the country and from India visit Muktinath Temple for the sake of getting salvation. Some say that bad works of people get purified by the holy spirit of Lord Muktinath, some say just a visit to the temple will help achieve nirvana, and some say building a small home of stones around Muktinath Temple means reserving a place in heaven. Besides these aspects, Muktinath village also offers the wonderful landscape of desert hills and the towering white snow-capped Annapurna Massif. Dramatic changes on the journey from greenery hills to the drylands and experience the lifestyle of the villagers from sub-tropical to Himalayan laps is the remarkable opportunity of this pilgrimage tour. Muktinath Temple holds the significant place among Hindus as well as Buddhist. Hindus worship the holy mandir as "Mukti Kshetra" means "place of getting liberation". Likewise, Buddhist worship the temple as "Chumig Gyatsa" means "hundred waters". As per the Hinduism, lord god, Vishnu incarnated in the form of Shaligram (fossils) here due to the curse of Brinda (wife of Jalandhar). Therefore, Shaligrams found here is worshipped as Vishnu god and requires to establish the holy chapel in every Hindus home. Similarly, Char Dham Yatra is incomplete without visiting Muktinath Temple and Pashupatinath Temple. After taking a holy bath under 108 water springs (located in the backyard) and two holy Kunda (ponds located in the front of the temple), devotees rinses their past sins and achieve the salvation from birth and re-birth of the lifecycle. Afterwards, the Char Dham Yatra get completed. This is the main reason why people visit Muktinath Temple. Likewise, the forehead of the Sati (first wife of god Shiva) was fallen in this place when Shiva was wandering with the corpse of Sati Devi. So, the place is also worshipped as one of the 51 Shakti Peeth and considered to be 106th among the available 108 Divya Desam (premium temples). Where does Muktinath Temple locate? Surrounded by the Annapurna Mountains, the two-story pagoda style Muktinath Temple is located in the isolated Mustang District of Nepal at an altitude of 3,710 meters above sea-level. The temple also visited as a part of famous Annapurna Circuit Trekking after crossing Thorong La Pass. From Kathmandu (the capital city of Nepal), the temple is in 406 km distance and takes at least two days to reach there either by motorable road or by regular flight. One can also charter a helicopter from Kathmandu and reach directly at Muktinath within 1:30 hours. The helicopter will be landed at Ranipauwa (jeep station) then ride on horse to reach the temple. How to go to Muktinath? Pokhara is the gateway to reach Muktinath. Pokhara is 206 km far from Kathmandu and takes 7 hours via motorable road and 25 mins by flight. From Pokhara, the onward journey depends upon the traveler choice. For easy access, take a 15 mins flight to Jomsom and jeep drive for 1:30 hours along the Kaligandaki River and visit the temple. Or trek all the way to the Muktinath from Jomsom halting one overnight at Kagbeni. One can also travel via jeep drive from Pokhara to Muktinath. The jeep journey will be very adventurous since after passing Beni the remaining road is bumpy and off-road. It takes eight to nine hours to reach Muktinath. Day 01: Kathmandu Arrival and visit Pashupatinath Temple. Day 02: Drive to Beni/Tatopani. Breakfast at hotel. Our guide will meet you and commence the journey in a private jeep. The first 306 km from Kathmandu to Pokhara to Beni is comfortable journey whereas the rest will be an off-roadway. The way follows the Trisuli River, Marshyandi River, and Gandaki River. Tirsuli River is famous for white water rafting and you may encounter the people boating here. Also, the famous Manakamana Temple is located en-route. There is Nepal's first cable car operator to visit Manakamana Temple. Today, we have insufficient time to visit the temple so will be visiting when coming back to Kathmandu. Rest at Tatopani. Day 03: Drive to Muktinath. Tatopani is the natural hot water source that has the capacity to heal the skin diseases. Take a bath in this miraculous water and drive to Ranipauwa, today's destination. The trail will be very adventurous and scenic. The path follows the Kali Gandaki River where one can find the Shaligram after searching for a long time. You will be passing through several small villages like Lete, Ghasa, Marpha, Jomsom, and Kagbeni. The Annapurna Massif will be playing hide and seek with you through the way. Closest view of Mt. Nilgiri from the Jomsom is the breathtaking opportunity to observe. Reach Ranipauwa Village and stay overnight here. Muktinath Temple can be seen from here and just in half hour walking distance. Day 04: Visit the temple and back to Pokhara. Early morning hike for 15 mins on flat and 15 mins ascending way until the temple. People unable to walk can ride on horse (own expenses). Take a holy bath under 108 waterspouts, two holy Kunda and worship Muktinath God. Visit Jwala Mai Temple, where water, fire, and sky meet together. Afterwards back to the hotel and continue drive back to Pokhara. The total journey will be around 8/9 hours. Reach late evening at Pokhara and rest. Day 05: Half day Pokhara City Tour and back to Kathmandu. Morning visit Sarangkot Hill Station for sunrise over snow-capped towering mountains. Back to hotel and take breakfast. After short rest proceed for half day Pokhara City Tour. You will be visiting Bindabasini Temple, Seti Gandaki River, Gupteshwor Mahadev Cave, Devi's Fall, and Barahi Temple. Then back to Kathmandu. En-route visit Manakamana Temple via cable car ride of 15 mins. Arrival at Kathmandu and transfer to your hotel. Free time. Take breakfast and you will have free time until 12 noon (hotel check out time). Then, transfer to the international airport for your onward destination. The time has come to say goodbye and bring the beautiful memories with you. Muktinath Temple Tour Trip finished here! Kathmandu to Muktinath to Kathmandu by private jeep. Twin bed sharing (2 - 5 star) hotel accommodation at Kathmandu and Pokhara. Tourist standard simple accommodation at Tatopani and Muktinath. Everyday breakfast and dinner at the hotel. Entrance/Monument Fees while sightseeing at Kathmandu and Pokhara. Trekker's Information Management Systempl Permit (TIMS). Lunch and Bar Bills like Mineral Water, Beer, Whiskey etc. Expenses occurred due to landslide, strike etc. Wants some modification on Muktinath Temple Tour itinerary? contact us to customize it.